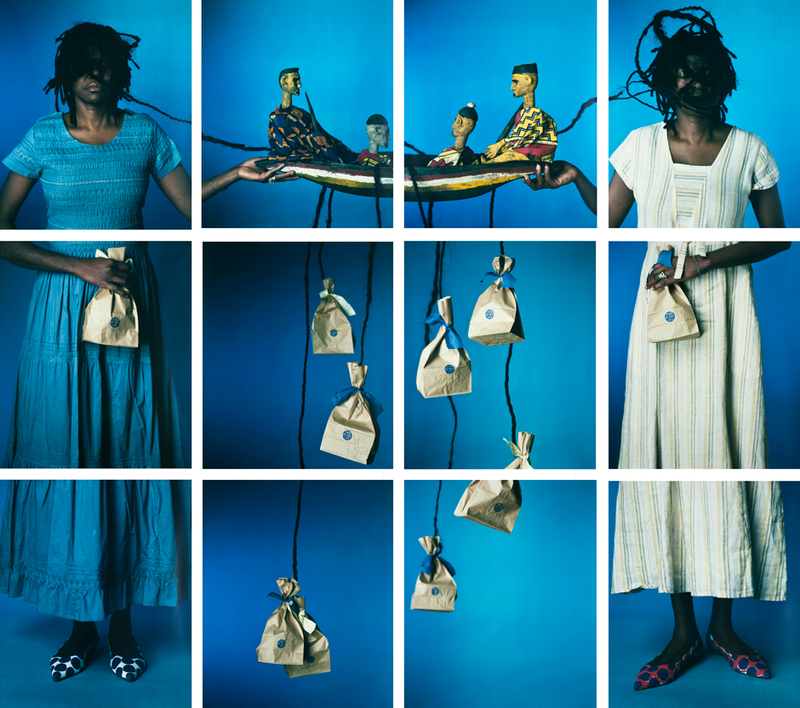 María Magdalena Campos-Pons (August 22, 1959 – ) is a Cuban-born artist based in Boston. Campos-Pons works primarily in photography, performance, audiovisual media, and sculpture. She is considered a “key figure” among Cuban artists who found their voice in a post-revolutionary Cuba. —From the solo exhibition, María Magdalena Campos-Pons: Dreaming of an Island at the Spelman Museum of Fine Art (2008). Campos-Pons was born in Matanzas, Cuba, in 1959 and grew up in a sugar plantation town called La Vega in Cuba. Her paternal great-grandparents were Nigerian (Yoruba). She also has Chinese and Hispanic heritage. Her African ancestors, who were brought over by sugar plantation owners in the late 19th century, retained many traditions and beliefs from Africa. Many of these passed-down traditions influenced and became part of Campos-Pons’s art. The African side of her family were forced to work as slaves on sugar plantations and as domestic servants. The Chinese side of her family also worked in the sugar trade as indentured servants in the sugar mills. When she was young, Campos relates that during a trip to the National Cuban Museum of Fine Art, she distinctly felt that black Cubans were conspicuously missing from the art. She did not feel as though black Cubans were equally represented. 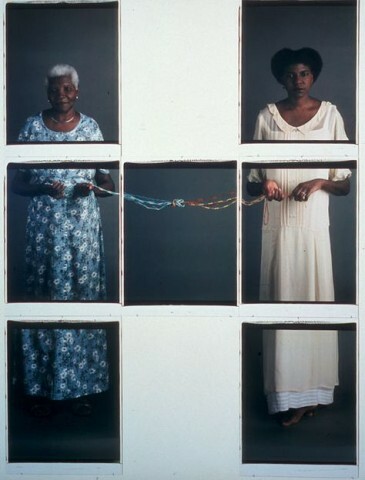 Campos-Pons earned her MFA from the Massachusetts College of Art and Design in 1988. Before moving to Boston in 1991, she left Cuba to take a fellowship in Banff, Canada. Since 1991 she has lived in Boston. Between 1986 and 1989 Campos-Pons was professor of Painting and Aesthetic at the Instituto Superior de Arte. She started exhibiting internationally in 1984. In the late 1980s, her art work gained “international recognition” with her abstract paintings dealing with female sexuality. Her work coincides with the rise of the New Cuban Art movement. Her early work, often consisting of separate, shaped canvases, suggested fragmentation of the female self and referenced Afro-Cuban myths. She also explored reproductive rights and feminism through her art. Since there was not a larger feminism movement in Cuba, it was only through the expression of art through artists like Campos-Pon and others that feminism was kept in the spotlight and popular consciousness. In the 1990s Campos-Pon explored her family’s ties to slavery and the Santeria tradition carried over by her Yoruba family members. She explores the rituals and symbols of Santeria in some of her work from this time period. The Seven Powers Come by the Sea (1992) and The Seven Powers (1994) are installations that address slavery and make mention of various Yo ruba gods and goddesses. After 1994, there was a shift in Campos-Pons’s work where it became what has been described as a “self-ethnography.” This work is largely autobiographical and has tended to examine her ancestors’ relationship with slavery and the sugar industry. She started using large-format photographs which were often arranged into diptychs, triptychs or other configurations. These works are reminiscent of works by Lorna Simpson and Carrie Mae Weems, but have a pleasing visual and narrative imagery that is uniquely her own. In the early 2000s, Campos-Pon began to create work that is more abstract and minimal than her earlier art. The minimalism and stream-lining of her art suggests that Campos-Pon has let go of various aspects of her own self while continuing to explore her identity. 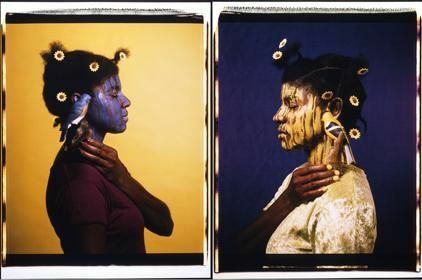 Campos-Pon is interested in showing “crosscultural” and “crossgenerational” themes dealing with race and gender as “expressed in symbols of matriarchy and maternity.” Campos-Pons says: “Of merging ideas, merging of ethnicities, merging of traditions. . . . I am as much black, Cuban, woman, Chinese. I am this tapestry of all of that, and the responses to that could be very complicated and could include even anguish and pain.” Other ideas that her work explores includes exile, immigration, memory and Cuba itself. Her art has been shown in scores of solo and group exhibitions, including solo shows at the Museum of Modern Art in New York City; the Venice Biennale; the Johannesburg Biennial; the First Liverpool Biennial; the Dakar Biennale in Senegal; and the Guangzhou Triennial in China. Campos-Pons’s work is in the collections of the Smithsonian Institution, the Art Institute of Chicago, the National Gallery of Canada, the Victoria and Albert Museum, the Museum of Modern Art, The Museum of Fine Arts, the Miami Art Museum and the Fogg Art Museum. Campos-Pons currently teaches at the School of the Museum of Fine Arts, Boston. She is married to Neil Leonard, a composer and musician at the Berklee College of Music with whom she sometimes collaborates professionally. Campos-Pons has received many awards and recognitions, including the “Mention of Honor”, in 1986 in the XVIIIème Festival International de la Peinture, Château Musée, Cagnes Sur Mer, France. In 1990 Painting Fellowship, The Banff Centre for the Arts, Alberta, Canada, in 1992 Foreign Visiting Artist Grant, Media Arts, Canada Council, Canada, in 1994 Bunting Fellowship. Mary Ingraham Bunting Institute , Radcliffe Research and Study Center, Cambridge, MA and in 1995 Art Reach 95 Award, National Congress of Art & Design, Salt Lake City, Utah.